Howdy, partners! 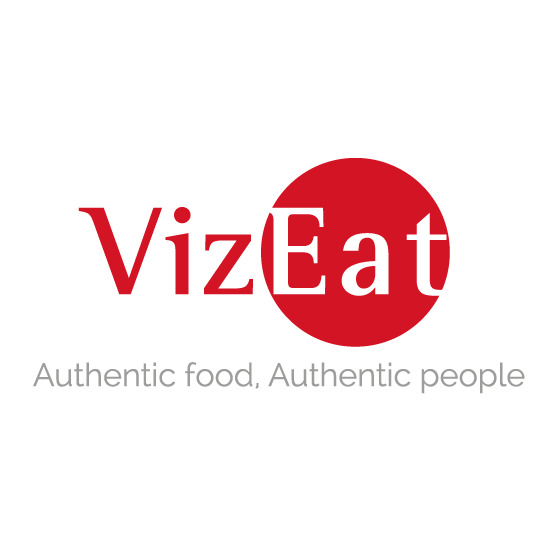 I’d like to welcome y’all to Mastication Monologues where you’ll read some of the most unique and creative restaurant reviews in the world. I’ve been around the world and eaten many interesting meals, but I have to say that American barbecue is one of the most comforting foods I’ve tried and enjoyed. The word “barbecue” originates from the Taino Indian word “barabicu” that was adopted by the Spanish as “barbacoa” and eventually made it to English as the form we have now. As for the origin of the cooking method, it was a Colombian exchange moment to thank for it. First, the Spanish introduced the pig, the staple of American barbecue, to the Americas, and the Native Americans showed European settlers how to smoke the meat and slow roast it over different types of wood to get different flavors. 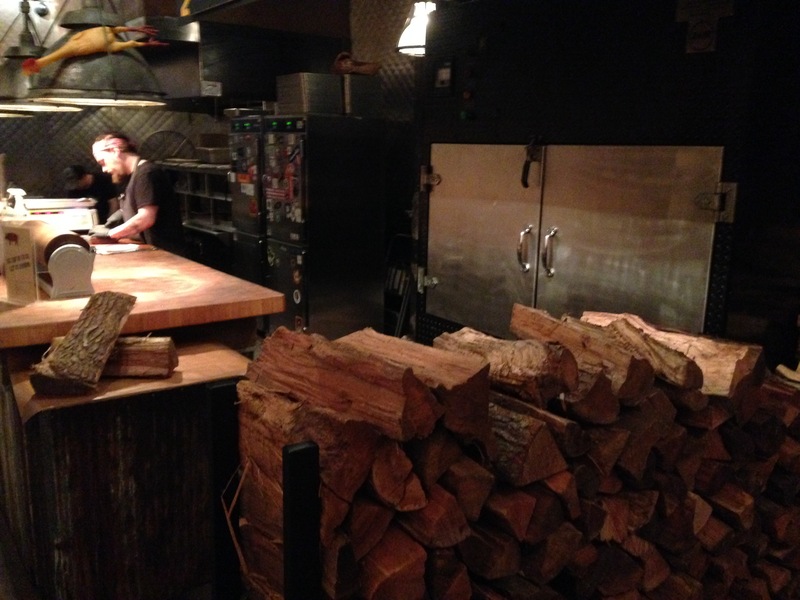 All of this slowly evolved as the barbecue we know today. However, if you go to different parts of the United States and ask for barbecue, you will encounter regional specialties that highlight the resources local cooks can utilize. For example, Hawaiian barbecue does have pork, but it is served in a luau style with a full pig roast and tropical fruit based sauces. While Midwestern sauces are tomato based and much sweeter than the spicier sauces from Texas. 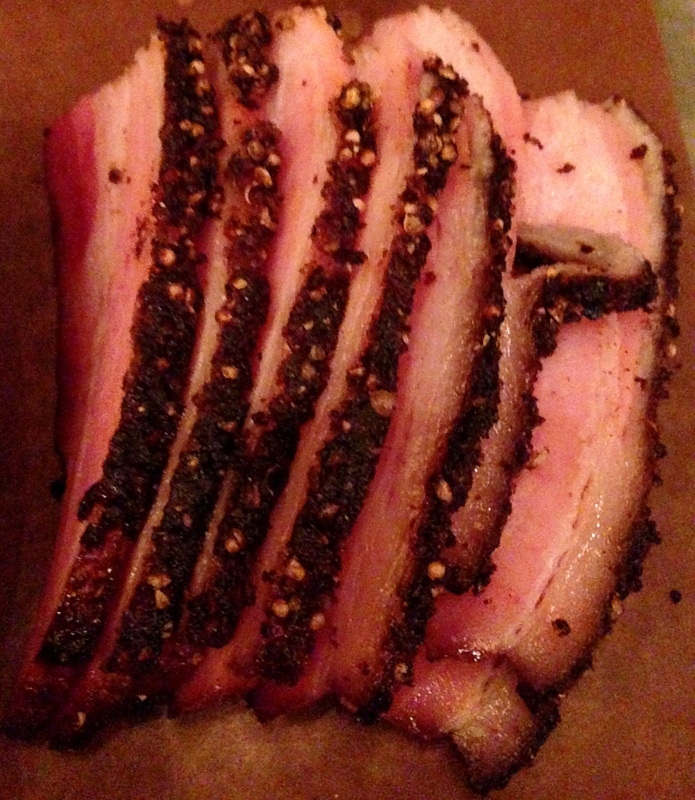 The list goes on and on, but today’s restaurant, Green Street Smoked Meats, falls into the Texas category of barbecue. 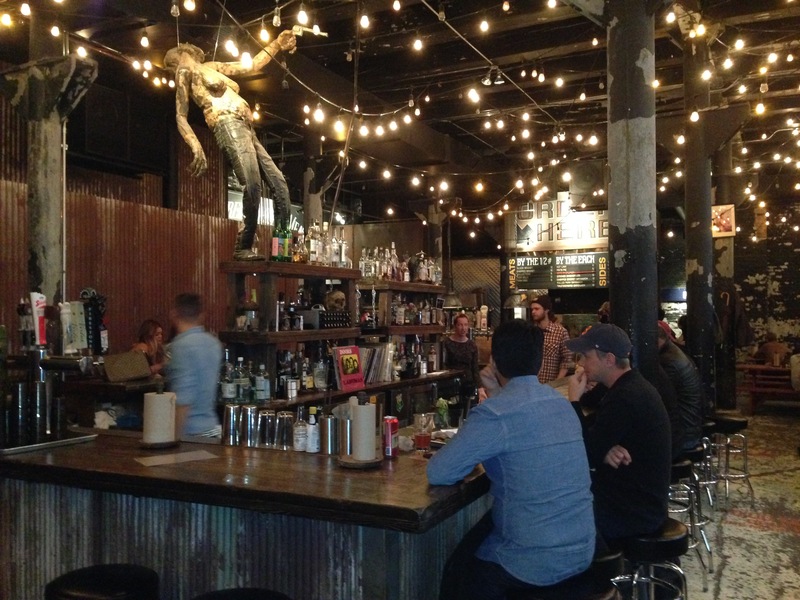 We ended up at Green Street in the middle of the day of all days for a foodie: Taste Talks. While we were still reeling from meeting the famous and friendly Rick Bayless, we really were fading from hunger after talking about so much delicious food. 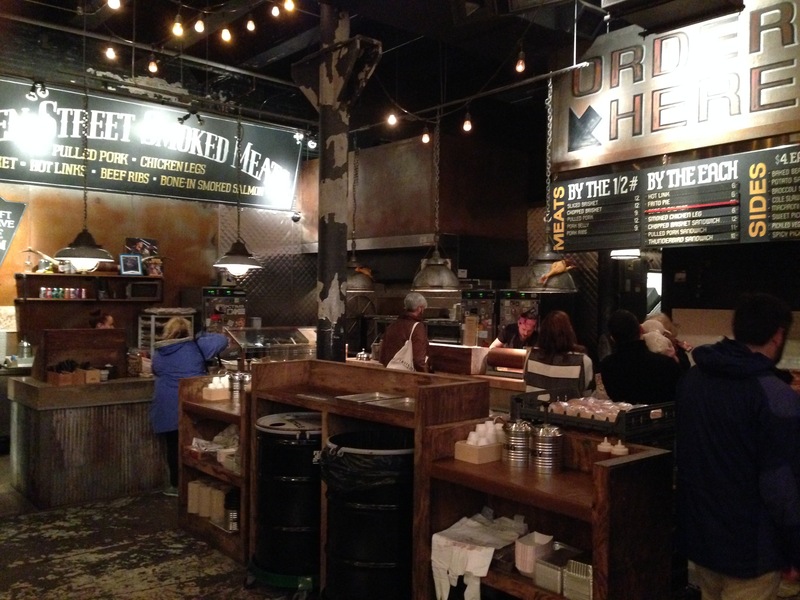 So we decided to go to Green Street Smoked Meats. 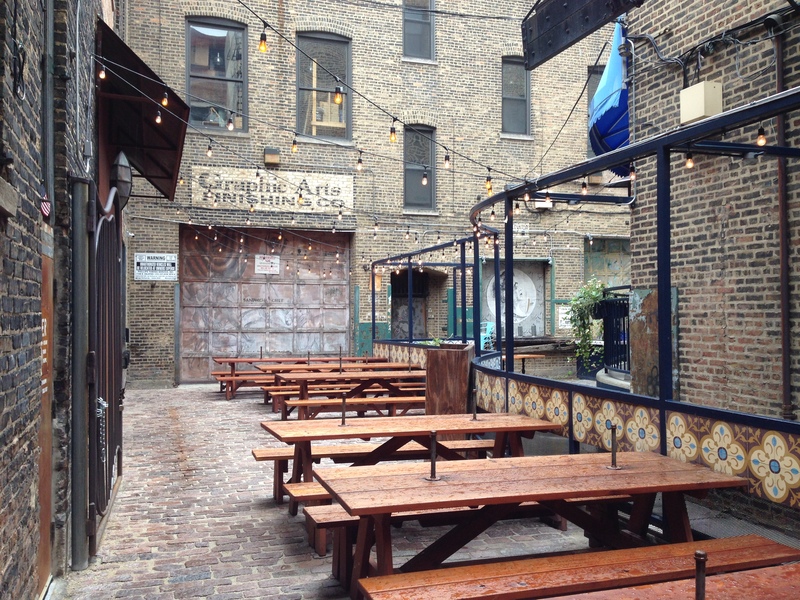 It was set back in a charming alley that would be hopping during the summer but not during our drizzly gray afternoon. Upon walking in, we were greeted with the jazzy baseline of Jerry Lee Lewis and sawdust on the floor. 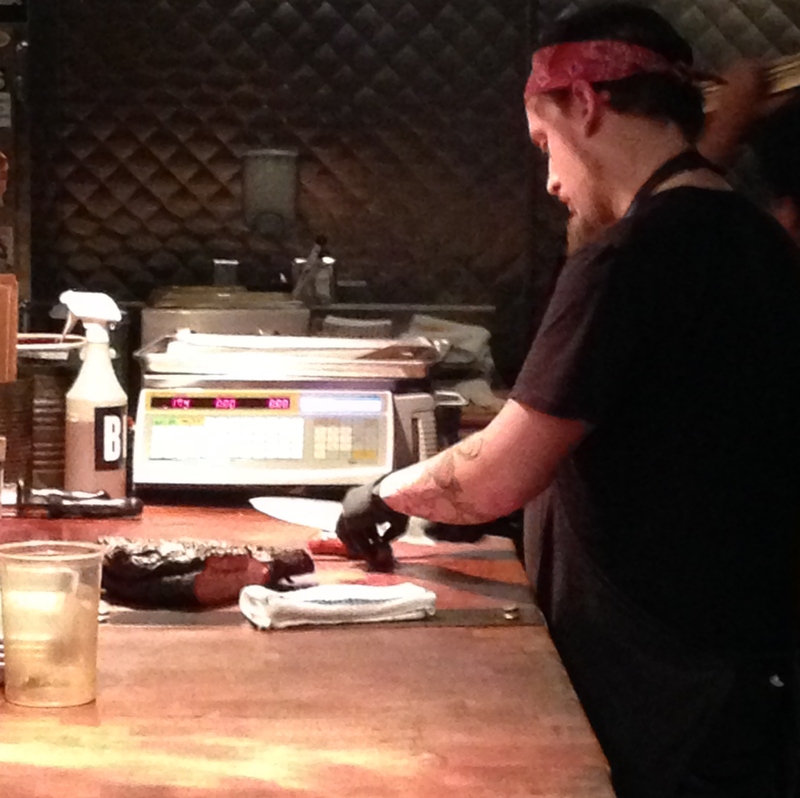 It was set up like a quirky Texas bbq roadhouse like you might find in the Lone Star state. 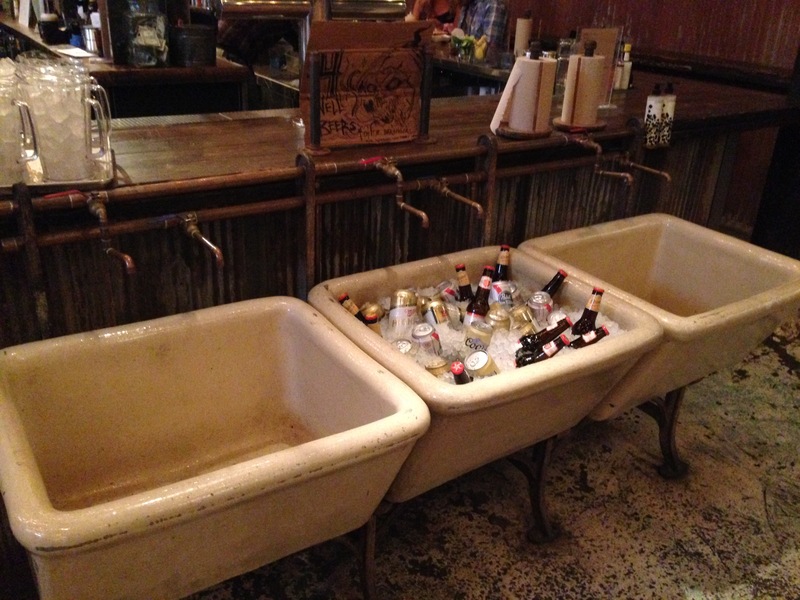 There were beers in old sinks filled with ice you could pick up before wandering up to the food board that was hanging in front of the all wood smoker. 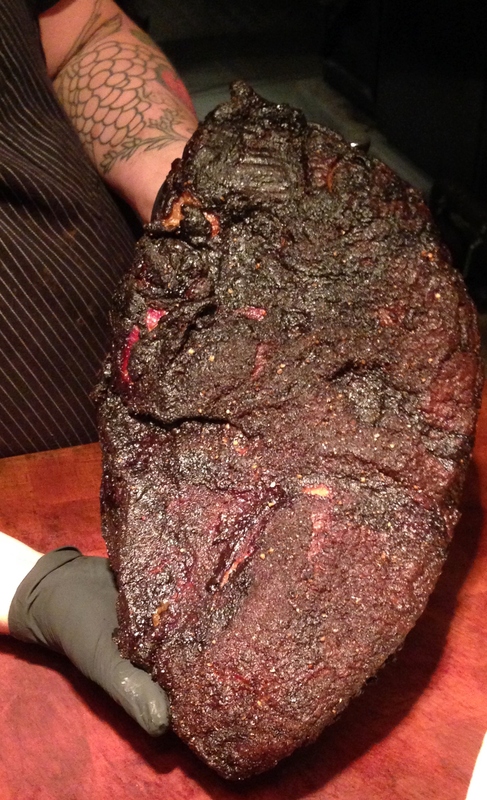 We perused the menu as the chefs were expertly slicing ribs, pork belly, and this sweet sweet brisket. 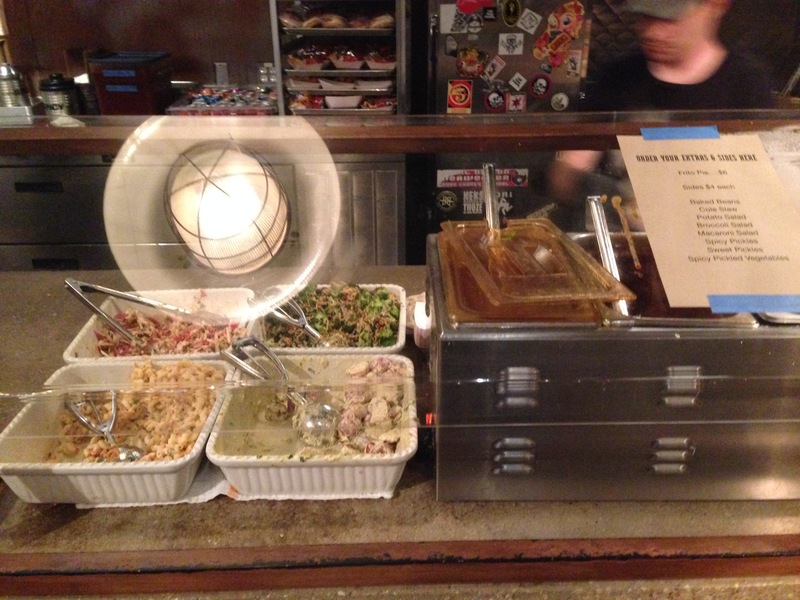 Eventually we decided on getting a half pound of pork belly ($12.50), a Frito pie ($6), spicy pickles ($4.95), and potato salad ($4.95). Once they served it all to us on a tray, cafeteria style, we got a seat at one of the communal bench seats in the main dining area. 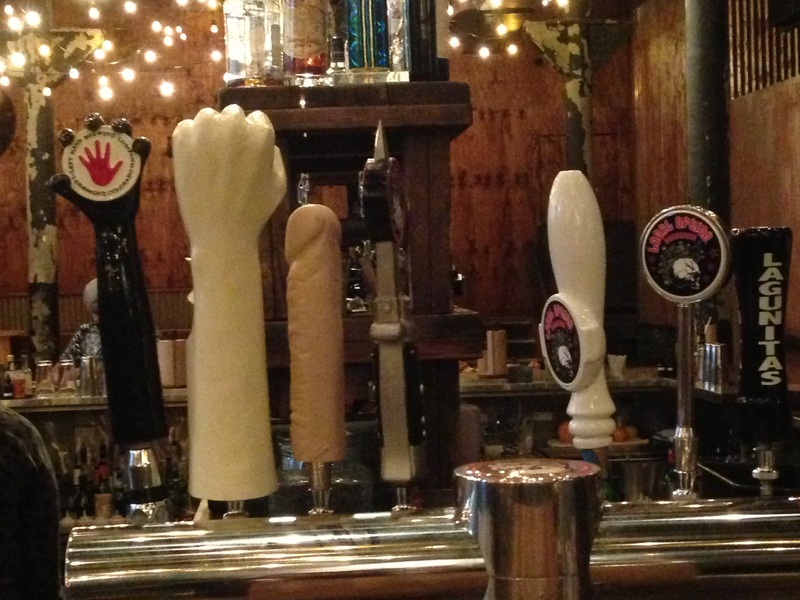 We also needed something to drink, so I bellied up to the bar to get Janice a beer she noticed at the bar due to its, shall we say, “distinctive” draft handle. I later found out that this beer was called a Morning Wood that was brewed in Chicago and was a lip-smacking, mildly malty red ale ($9). 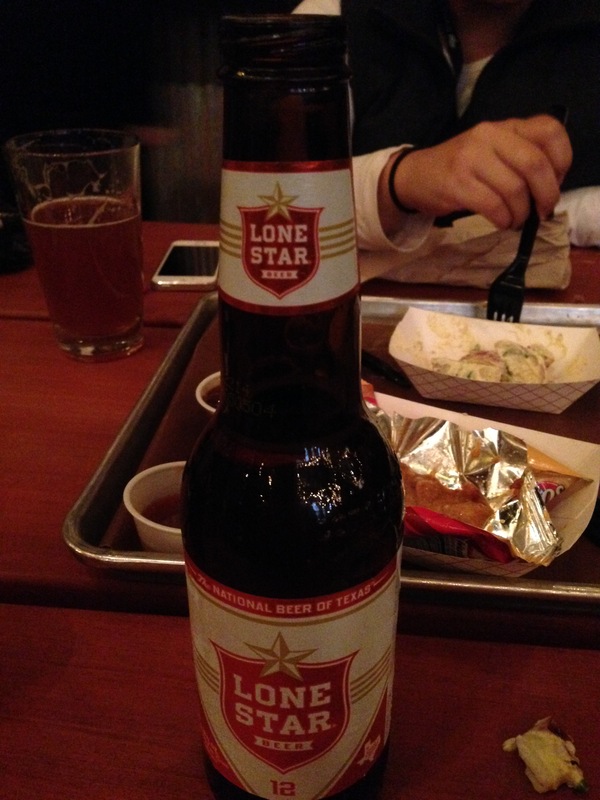 As for me, I got a cheaper Lone Star beer ($4) which dates all the way back to 1884. The price justified the flavor. 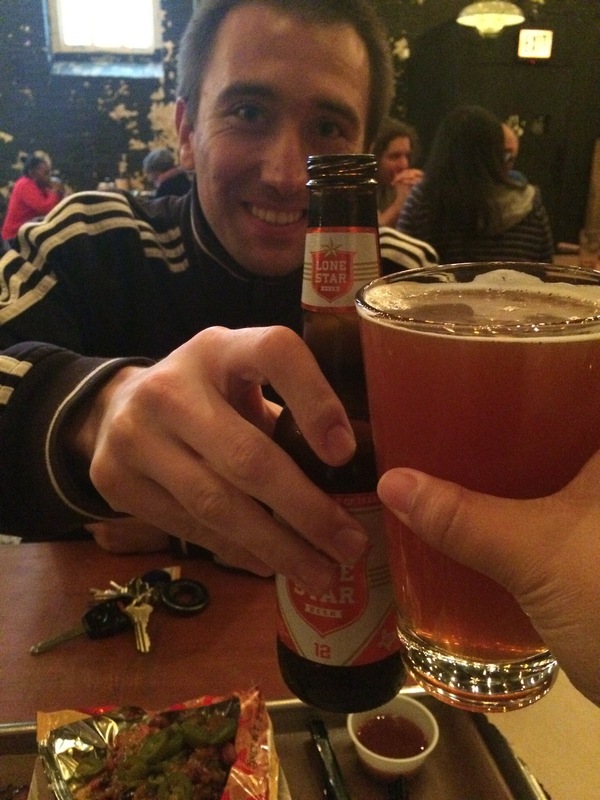 It was your typical American lager with roots in German pilsner traditions, i.e. light on taste and body. 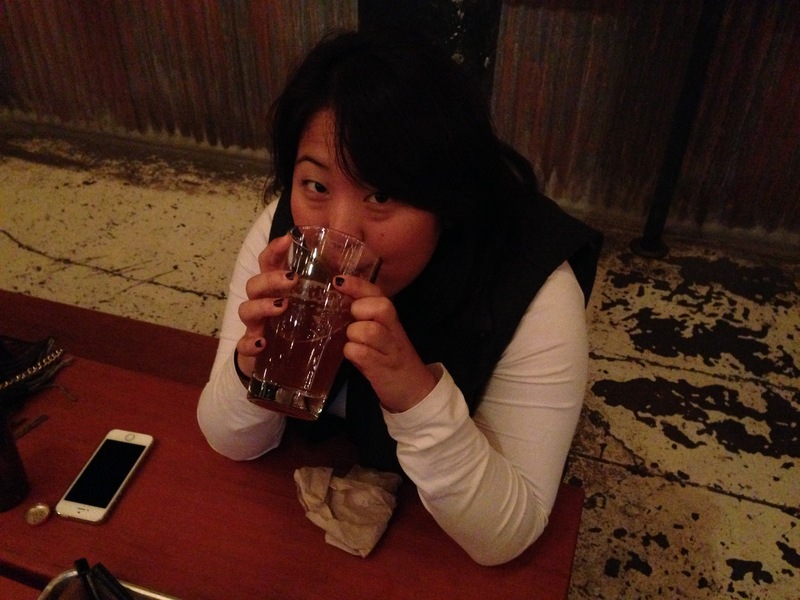 However, it was clean and refreshing while sampling all of our food. First, all of it was the perfect amount of food for the two of us. Second, the pork belly was a meaty masterpiece. Not only was it sliced to an ideal thickness to let it melt on your tongue, but the peppercorn crust combined with the smoke gave it a real bold flavor with a spicy afterbite that kicked its spurs into your palate. The Frito pie has made many appearances on King of the Hill, including an episode where a Bostonian client’s wife was taken aback by this spicy Southern treat. I think the best way to describe this unique Texan side would be corn chip nachos. 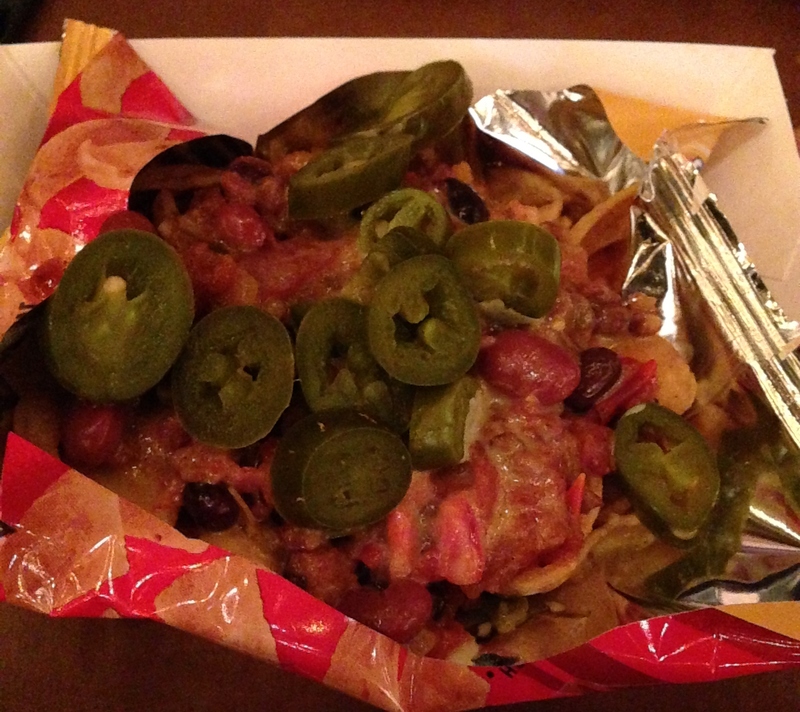 It was served up in the Frito bag, and the chips were covered with cheese, ground beef, beans, and jalapenos. Unfortunately, taste-wise it wasn’t as big as the state it hails from. The Fritos were too soggy due to the massive amount of toppings, so it just tasted more like a chili with a couple jalapenos on top with the occasional crunch. The spicy pickles were not as disappointing but not spectacular. True, they were sour and provided a fresh alternative to the heavier meat dishes, but I didn’t really understand where the “spicy” element was. 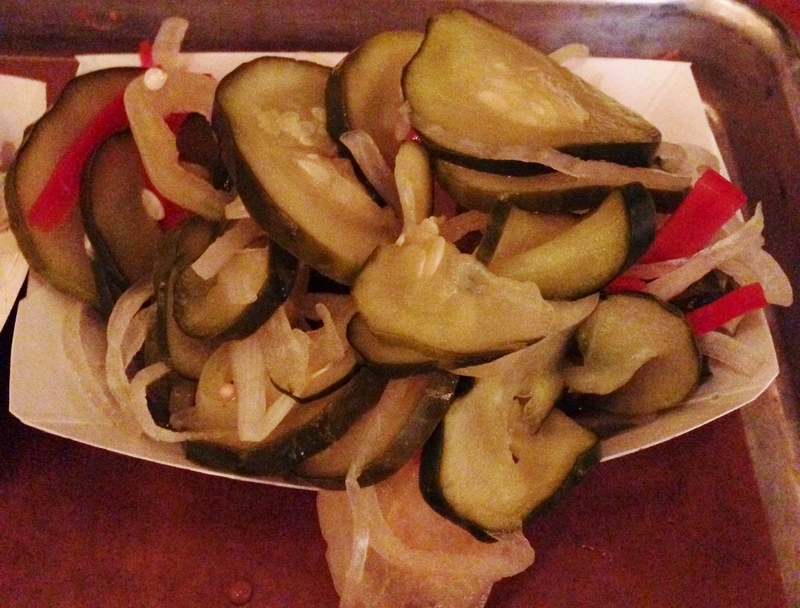 I just tasted a lot of vinegar and pickling brine coursing over the onions and pickles. 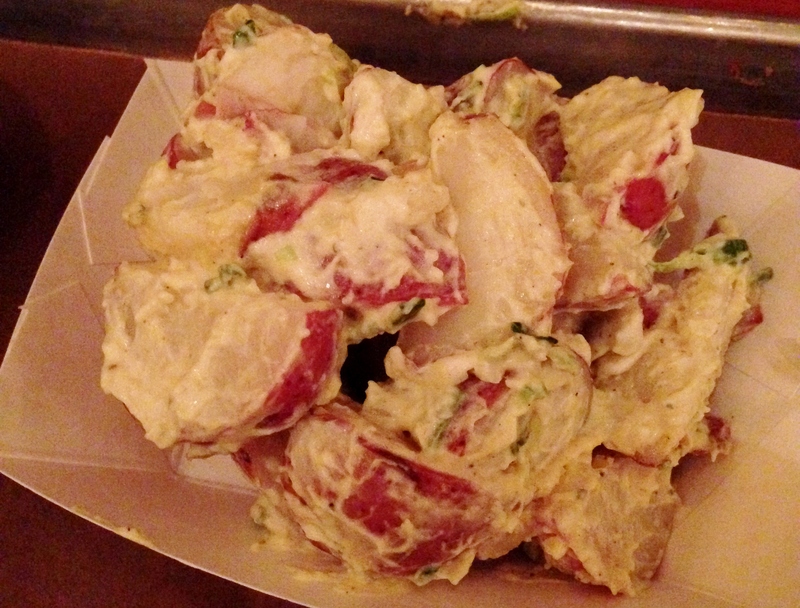 Finally, there was the potato salad that was actually the better of the two veggie sides. It utilized small red potato segments coated in a semi-thick slathering of cumin-infused mayo that gave the tubers a funky zest with each forkful. 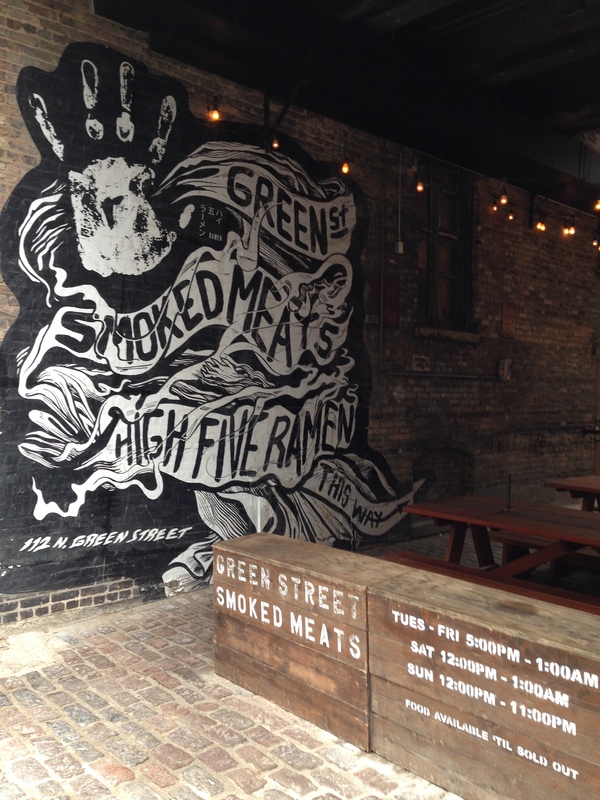 Overall, our trip to Green Street Smoked Meats was an enjoyable visit during a day all about food. 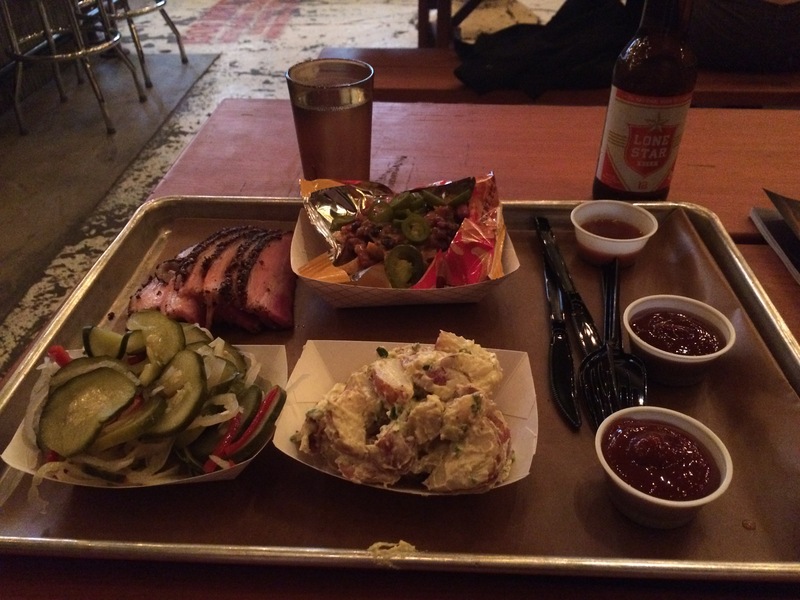 While I’m sure it doesn’t truly recreate the true Texas flavor like the home of the Cowboys and the Bush family, I’d recommend it as a fun and finger-licking good time and one of the best barbecue joints in Chicago. Just remember to bring your wallet, buckaroo! Posted in Alcoholic, American, American Cuisine, Barbecue, Beer, Beverages and tagged ale, barbecue, Beer, Chicago, pepper, Pilsner, pork, potato, salad, Texas, vegetables, West Loop. Bookmark the permalink. Thanks, Julia! 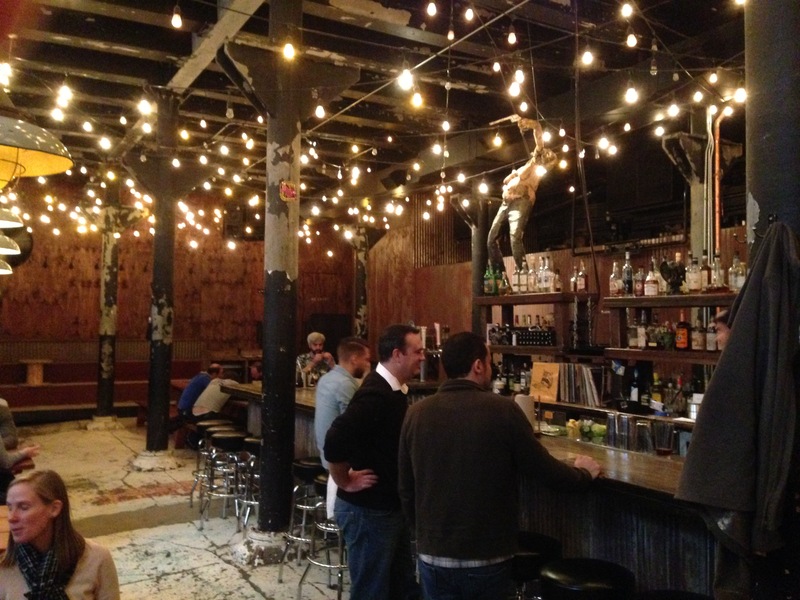 I’ll add my favorite barbecue restaurant to the site.